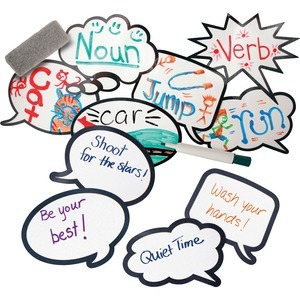 Say what you need to say in a bold way with these laminated speech bubbles. Oversized, dry-erase construction lets you write legible messages or announcements again and again. Heavy-duty cardstock is laminated for years of long-lasting use. Speech bubbles are perfect for teaching students how to structure quotes and sentences. Speech bubbles are designed for children ages 4 and above.